Vital Imagery Blog: Who Wouldn't Love These People and Pups Illustrations? Who Wouldn't Love These People and Pups Illustrations? The connection of people with dogs goes back centuries. They were first domesticated to protect person and property. And also sadly as a resource for food, fur and as beasts of burden. Though they are still kept for security and working purposes, they have also, over time, become pets, favoured for their devotion and loyalty. Those who love them have long recognized that people could do well to act more like their canine friends. Renowned 'dog whisperer' Cesar Millan has said, "I believe in integrity. Dogs have it. Humans are sometimes lacking it." A dog has been a part of my family for as long as I can remember, until two years ago when we had to say goodbye to our Ani. It was one of the hardest things I've ever done, enough so that the idea of experiencing that kind of heartbreak again has kept me from even thinking of getting another one. But I do miss what she brought to our life. The attention and affection she gave were a big part of it, but only a part. Reports say she improved my health. Simply petting a dog can lower blood pressure and reduce stress. I felt safe with her around, knowing she would protect me with her life if necessary. I talked, she listened. She was my friend and often had a better sense of how I was feeling than I did. She didn't care if I wore sweats and no makeup, had garlic breath or was in a vile mood. I'd like to think too that she might have made me a little better person, setting an example of unconditional love and forgiveness any human would do well to emulate. Whether playing catch, going for a walk, or sitting quietly on the deck watching the world go by, she was with me and in so doing made my life a little more whole. 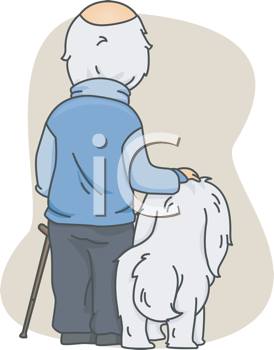 These collections of illustrations exemplify that bond between pooch and person, whether playful or pensive. Do These Photos Tempt You?